WHILE BARACK OBAMA’S Irish links are considered by some to rather tenuous the same does not apply to one US politician who is tipped to succeed him in the Oval Office in two years’ time. Maryland Governor Martin O’Malley has a more Irish sounding name for starters and so it’s no surprise that he has strong Irish heritage as he told TheJournal.ie in an interview this week. The Democrat, who has been open about his presidential ambitions, was in Dublin as part of a US delegation which included the iconic civil rights leader, John Lewis, who gave a lecture at the Department of Foreign Affairs last night. “I really wanted to be here to hear John Lewis give this address,” he said. “He’s such an iconic figure in the United States. Lewis’s speech focussed on the civil rights struggle in the United States and was part of the Frederick Douglass/Daniel O’Connell Project, named after the famous US abolitionist leader and the great Irish liberator. O’Malley’s Irish heritage can be traced back to his great-grandparents who, he said, came from the west of Ireland. His Dad’s family are “100 per cent Irish people” while his mother’s family are half German. His great-grandfather, also named Martin O’Malley, emigrated to America in the late 1870s and Martin O’Malley junior has always been keen to maintain his Irish roots, visiting our shores on several occasions. It was in his teenage years, and long before politics, that he took up a guitar and took to the stage as the lead singer of an Irish music band named ‘O’Malley’s March’. “I fell into an Irish band with a group of older guys and so I always played music and the music kind of opens you to the culture and the history and makes it all come alive,” he said. But what of those presidential ambitions? O’Malley was understandably reluctant to talk about the matter while in Ireland and away from the political bubble in the US. “You’re gonna ask me that question here when I’m out of the country?” he said only half-jokingly. However, he was good-natured in giving a fuller if still unclear response, saying: “You’ll forgive me for the self-discipline in not talking about it. “I’ve served a very good people in Maryland and in Baltimore and consider myself very blessed that we’ve been able to accomplish so much in the face of big problems and tough times. And what of the man who he could replace in the White House? Now well into his second term the ‘hope’ and ‘change’ promised by Barack Obama hasn’t quite happened they many expected it would, but O’Malley is a staunch defender of his party colleague. “I think he’s accomplished a lot of very, very important things. These have been very difficult times economically,” he insisted. O’Malley cites healthcare reform, Obamacare, as a huge achievement that will mean “a person won’t die on the street because of an inability to get proper healthcare”. But more than all of that O’Malley believes that the very election of an African-American as president was an important and landmark moment in US history. 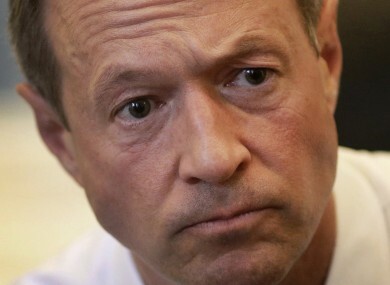 Email “Meet Martin O'Malley, the Irish-American who could be the next US President”. Feedback on “Meet Martin O'Malley, the Irish-American who could be the next US President”.